This month my flash fiction story, ‘The Stories of Your Name’ appeared in Issue 3 of Arsenika. It’s 600 words of genre-mashing vignettes which come together to explore the significance we attach to the names of those we love, what their name means to us and how we value it. Arsenika is a relatively new journal for speculative flash fiction, poetry and reviews which publishes quarterly. It’s a great publication, edited by S. Qiouyi Lu. The issue in which my work appears features some excellent pieces from internationally, culturally, and gender diverse writers and I’m really proud to be a part of the publication. My short story appears in Aurealis Magazine, edition #103. It was inspired by an Instagram post by Australian author, Alan Baxter, in which he had captured a row of large round bales of hay in a paddock at the bottom of a hill. He captioned it with a line about how they were like eggs, speculating on what sort of beast might have laid them there. It was a familiar scene to me, having grown up in rural Victoria, and so my mind set to working. That was some time ago now. As the story was percolating in my head I was also hearing about my maternal grandmother’s experience. She was a Sydney girl who fell in love with a soldier returned from World War II. My grandfather’s service granted him the opportunity for a settlement on a dusty patch of dirt up by the Murray River, and so my grandmother found herself out on a red-dust vineyard, far from the city, with five children under five and few modern conveniences. I wondered about how that experience had shaped her, and how it had shaped her children, and how the strength of her will had been passed down through generations. These ideas coalesced around an ambiguous setting, a rural Australia in which a strange beast and a headstrong girl might meet one night in a rain-soaked paddock. If you’d like to check it out and support Aurealis (a great Australian SFF publication) you can purchase it for a couple of bucks here. It sits alongside a cool debut ‘AirBnB for bodies’ story by Mitchell Salmon and the tale of a brand-aware Superhero by Brian C Baer. You’ll need a (free to register) Smashwords account. 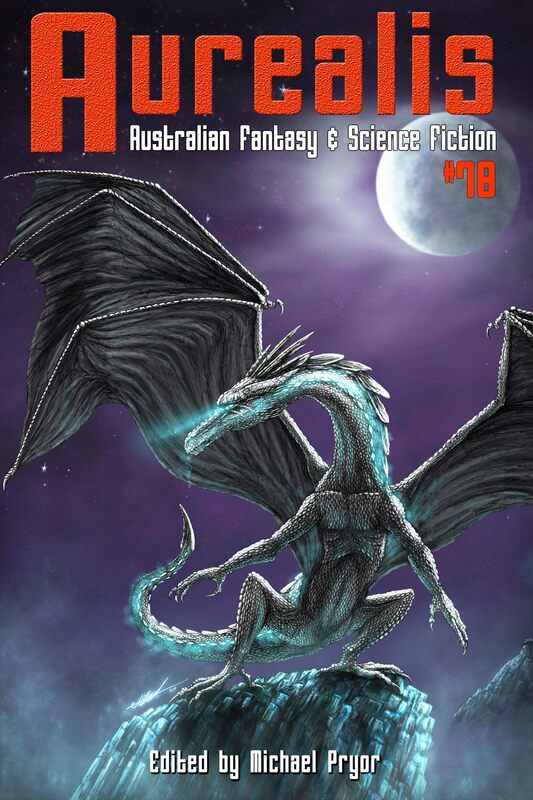 My short story, ‘Enfolded’, features in the latest (78th) edition of Australia’s longest running Fantasy and Science-Fiction magazine, Aurealis. It’s a “bracing neo-noir” about a guy with a special power who thinks he has left his criminal past behind, only to find himself dragged back by fraternal loyalty. It has been a goal of mine for some time to have my fiction grace these (electronic) pages. Aurealis has a great reputation for quality and is a well established part of the Australian spec-fic marketplace. In addition to new fiction, they provide great non-fiction material for readers and writers within the genre and beyond, and have thoughtful reviews of Australian and international work. The 78th edition is available for download in a range of formats, including epub and mobi for ereaders. At only $3 Australian and less than $20 for a subscription, it’s great value. In the supermarket things are getting restless. People shuffle in the queue for the self-scan machines, glaring passively, harrumphing at no one in particular, but pointedly and with feeling. At the self-scan machines things are little better. Toes are tapped at tardy assistants. Red lights blink. Calm mechanical voices ask for items to be added or removed from the bagging area. Shrill human voices imprecate. There is a man – short and sullen, overladen with fruit – who cannot pay for his rockmelon. An assistant finds it for him. It is under M, because it is a melon. Together they look to the complaints counter. It is oppressed by the crowd that has gathered there. Its defenders are inadequate, soon to be overwhelmed. The sullen vegetarian snarls, his teeth clacking and his eyes all a-spark. The vegetarian’s eyes bulge. Veins rise on his neck, at his temples. Red lights are blinking over the three machines. ‘Just a minute,’ the assistant says. From somewhere in aisle three there’s a predatory howl. The queue for the machines surges. A display of produce crashes to the ground, shattering glass and spilling preserves and spreads marked down for quick sale. At check-out number seven there’s a young girl’s scream. At the complaints counter the splintering of wood and a panicked cry. Teeth spill, skipping across the polished floor. A head strikes a counter with a wet crack. There’s the smell of blood and violence in the air. The vegetarian leaps upon the assistant, bears him to the ground where others rush in with boots and stomping feet for them both. Someone tries to climb the bread aisle, to safety, but the whole thing topples and they fall into the surging mob. Men are vaulting the complaints counter, clawing at their victims, bursting throats between their teeth. I take my receipt and the goods I’ve purchased. I step away, through the automatic doors, past the buskers splintering their guitars against each other, past the collisions and chaos of the car park, to my car. Best to get home. The kids will be wanting their dinner. This is an early draft from part of the prologue I had planned to my completed novel manuscript titled Exile. The structure of the prologue was to be three short vignettes of related events which affect the main characters but don’t directly involve the main characters. I’ve posted the first one before. This is the third. I’m going to keep the second up my sleeve. As with the first this too has been cut from the manuscript in its current form as I revise and edit toward a goal of 120,000 – 130,000 words. The village of Grusby had only one inn, and some nights even that one was all but empty. Not tonight. On nights like these it heaved to the joyous strains of bawdy songs and clumsy dancers. Men from the mines had come in to town with raw nuggets to trade and deep thirsts to fill. A shambolic attempt at a minstrel band strummed and stamped in one corner, one man keeping the beat by slapping his meaty palms onto an empty barrel. The press of humanity had opened a circle in the centre of the room; benches and tables had been pushed against the walls and then climbed by grubby children grinning idiot grins through a latticework of crooked teeth. In the centre of the open circle a whip-thin boy who would have seen maybe sixteen summers blushed deep and awkward in ill-fitting clothes. The girl who danced around him was younger still but free; a picture of innocence as she twirled in the traditional circles, following paths that her mother and grandmothers had carved over generations. The stranger from the capital stood isolated in the crowd. He pressed his tired shoulder-blades against the rough wooden walls and didn’t move more than arm’s length from the barkeep and his tapped barrels. Even as he raised the tired old tankard to his lips he reprimanded himself for drinking. He shouldn’t relax yet, he was north of the Lascon now, nearly home, but nearly was not quite enough. At first he had showed some resistance, when there had still been a sun in the western sky and the inn had been his alone, but the crowd had crashed through the doors like a wave upon the shore and he had been swept along like so much flotsam. He watched the girl curtsy in that clumsy provincial way, and the boy’s red face lit up with childish delight. He couldn’t help but be drawn along. It was a ceremony far removed from the King’s Court, and the finery here was aged and faded; family heirlooms or relics of long dead ancestors, but it was a betrothal none-the-less, and the father of the bride was generous. No one had asked him his name, and he was glad not to have to give it, but they had clapped him on the back and filled his tankard and when the spitted boar had been brought in from the fire-pit the smell had been irresistible. He had been in the saddle for over a week to reach this point. He had survived on salted meats, scavenged berries and stolen crops. He couldn’t remember the last time he had tasted ale, or mead, or roasted pork still hot from the coals. He relished the opportunity to have a meal without looking over his shoulder, without waiting for the sounds of pursuit, without suddenly starting up from his food at the slightest sound and reaching for the reins of his horse. Here, ironically surrounded by strangers, he had found himself relaxing; relieved. His full stomach rumbled contentedly and the ale kept sour memories at bay. The King’s forests on Ile Aux Cerf seemed farther away from this dirty little mining town than the mere miles of road and stretch of sea that lay between them, farther even than the days of travel he had spent. Ile Aux Cerf and and all his past was a lifetime away – a world away. When he had started in his service to the Duc he had been little more than a boy. His initial nervousness had been expected and easily passed off as normal for a peasant among the peerage. Over time he lost those nerves; lost himself in the role he had been asked to play. Despite himself he had even come to like the Duc’s son; an ambitious man, having been of an age to rule for nearly two decades, waiting for the old Duc to die, but personable and given to treating his serving staff well. As a man in the Duc’s service he found that Latonville had been open to him. Merchants, whores and minor nobility had offered him bribery in goods, services or coin. He had refused them all, adding polish to a veneer of loyalty, ignoring dozens of gilt-edged chances to fulfil his true purpose, until eventually that purpose was all but forgotten. It wasn’t his first trip to hunt the forests on the King’s own island, and nothing had seemed amiss… not until the ferryman’s bony hand had brushed his sleeve and the wrinkled old man had nodded in a way that may have meant nothing and yet meant all the world would change. For a moment he hoped he had read the man’s gesture incorrectly, but the pale blue eyes, piercing and sad, had left no room for doubt. He nodded a reply. It had been easy to accomplish. Ridiculously easy. Idiotically. He shook his head even now at the thought of it. With one final wrench in his gut he had loosed the arrow, so mortally accurate as to seem accidental. The Duc’s son had slid from his horse with almost comic slowness and it had seemed like long moments before he joined in their panicked rush back to the ferry. He had worn a mask of grief and shock and was never suspected. The ferryman’s eyes had burned into his back the whole way back to the capital but he didn’t dare return the glance. He had stayed for a week in the capital, waiting for news of the festering wound, feigning dismay at the blood-loss. Eventually the inevitable death was announced, as he knew it would be, and he had borne their consolations and pushed the guilt down deep. That had been the start of the nightmares, and they had followed the next day, as he fled toward the River Laton: northward and homeward. They must have realised his betrayal soon after he left. Perhaps the same day, perhaps the next. He had ridden one horse into the ground and stolen another outside Fourche. He had eaten in the saddle, even slept at times despite himself. If they had followed they would surely be well behind and they would surely not have come this far north of the river. The nightmares hadn’t eased, and even tonight among this crowd of local miners in full revel he had seen visions of the man he murdered swim across his vision. The ale was having its effect though. His tankard was filled again without his realising and even the discordant singing was not as offensive. The young couple had been tied at the wrists with a loose knot of ribbon and were dancing a waltz of intense concentration. It was sweet, he decided: innocent. He had missed that. It had been a long time since he had felt innocent and he doubted he deserved to. A toothless old uncle, streaked with the dirt of the pit despite his best efforts, was chattering to him in the deep, guttural dialect of the hills. He had been away from home so long, had not spoken his mother’s tongue in so long, that he was having some trouble following the miner. The base accent, the ale and the man’s toothless gums conspired to further slur language already roughly formed. He nodded and grunted occasionally, smiling at the right times and joining in with the man’s exuberant laughter. In the middle of the room the empty circle collapsed as the ceremonies were completed and impatient revellers cascaded into a chaotic dance. The constriction of bodies eased and the stranger realised the pressure on his bladder. With a perfunctory nod to the toothless old man he pushed himself away from the wall onto legs drunker than he had realised. From the corner of his vision he noted the women queuing for the inn’s single privy and steered away instead. In moments he was outside beneath a clear sky bright with stars. As he staggered away from the inn and down a narrow alley between empty houses his eyes stayed on the sky above. The fat red moon was swollen in the night, huge and full, and around it were spread so many glittering stars. Here, away from the city, away from the torches and oil-lamps, there seemed so many more of them. He was still fumbling with his clothes when something struck him like a fist in the shoulder. He turned, expecting to see an enthusiastic partygoer, instead seeing only the empty alley. When he tried to call out he succeeded only in drawing in a painful breath. For a moment he was confused, until he saw the point of an arrow pressing against his tunic, spreading an ugly red spot across the fabric. He tried to touch it but his right hand hung limp at his side, refusing to respond. The pain hit him with realisation. Over his shoulder he saw the feathered shaft. His head swum and he leaned heavily against the wall with his one good hand. He had turned enough that the second shaft glanced off his temple. It skittered away as he went to his knees and a flow of blood swept into his eyes. Chattering voices sounded in the dark. The black earth struck the side of his face and his breath came in shallow, wet, drafts. When a stalking figure resolved out of the night and flipped him roughly onto his back he tried to plead or beg or curse. His voice bubbled bloodily in his throat and spilled wordlessly in warm, red gouts. The archer yanked at his hand, trying to dislodge a thick golden band from his third finger. For a moment he thought that this was a robbery, a stupid piece of ill-chance, but even as he thought it he knew it was not. He had been followed, or he had been careless, and this was the reward. In the end the ring would not be dislodged, but the man had taken it anyway, and his finger with it. The crack of his bone had sounded distant to his ears and the knife moved as if it were not him being cut. Even the stars seemed dim and distant. The knife hung above him then, its bloodied blade swimming in his narrowing vision. Swiftly it plunged – into his neck perhaps, or his chest. Once. Twice. Another just to be sure. The assassin pulled a hooded cloak over his head and returned to the embrace of the night from whence he had come while the stranger from the capital fixed his failing sight on the waning, red half-moon and felt his life’s-blood soak into the earth. Once again let me know what you think.